Barbados' Askari Elson battling in Greece! Seventeen-year old Askari Elson (pictured right) is one of the brightest talents out of the Caribbean region. Having first represented his country in two Olympiads (at ages 14 and 16), the US-based Elson is currently in Halkidiki, Greece competing in the World Youth Championships. He is competing in the Boys' under-18 section which is headed by GM Shakhriyaz Mamedyarov (2595) of Azerbaijan. Having been a successful player on the national circuit, Elson most recently won the Barbados' Sagicor Junior Open, edging out both Daren Wisdom and Alain Morais of Jamaica. He also placed clear 3rd in the Barbados National Championship. His most recent international competition was the Central American and Caribbean under-20 Championship where he placed joint 3rd. 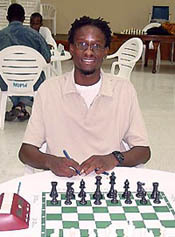 The Barbados Chess Federation website mentions that Elson was born on 30th July, 1986 and graduated from Harrison College. He is also a talented athlete and represented Harrison College at the World Scholar Athlete Games, Rhode Island in 2001. Currently, Elson is studying in New Mexico and won the Pir Maleki Memorial tournament earlier this year. This is his first time competing in the World Youth championships.